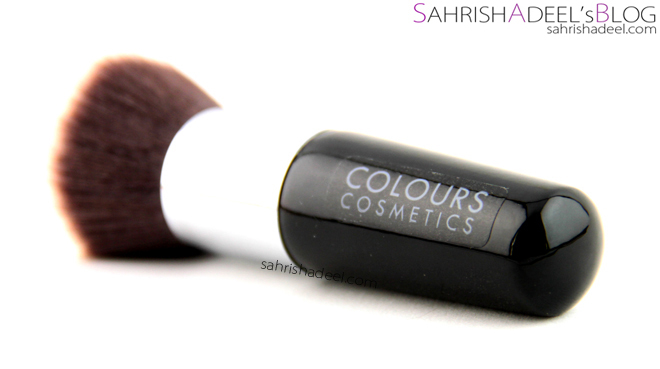 Short Handle Flat Top Foundation Brush by Colours Cosmetics Malaysia - Review | Sahrish Adeel - Malaysia based Pakistani Beauty & Lifestyle Blogger! Have you ever heard of a brush that is specially made for Asian hands? Well today I have a review on a brush that might be just the one you are looking for. 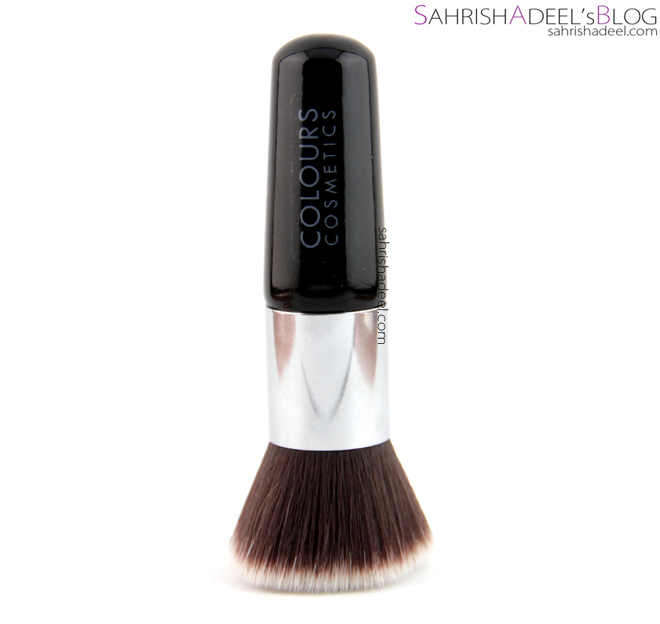 Colours Cosemtics Malaysia has worked on a new in market Short Handle Flat Top Foundation Brush. - 100% Cruelty Free, vegan all the way. - Made of synthetic bristles. Product is halal. - Quality is assured, all brushes have been hand-checked before putting to sale. - Perfect for even full coverage powder,liquid foundation & BB cream applications. - Easy & fast application - definitely a TIME-saver for those who are in rush to go out! This short handle brush has been specially designed for Asian hands. It has synthetic bristles and has a flat top. Total length for the brush is about 9.5 cm. This brush arrived in just one day and the brush itself was packed in a transparent but thick plastic bag. I was really excited when I received this brush mostly because I never heard of anything specially made for Asian hands. Even though they mentioned on the website to wash it before use, but lazy me could not wait for that long. I was really impressed by the soft but really dense bristles a cute design but I was afraid that it might not give a good finish since the bristles are not really stiff. The handle has a solid grip and this cute little thing is pretty comfortable to carry in the purse. On my trial for the application, I used it for liquid and powder products and I must say that it is dramatically quick. 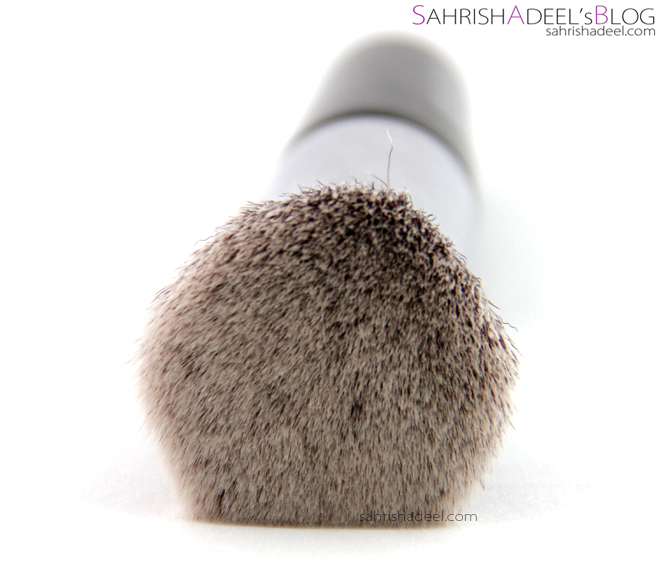 The soft bristles gave a flawless finish and blended both the powder and liquid products really nicely. It really buffs the foundation into the skin to give an even and smooth finish. Since the bristles are synthetic, it does not soak up too much product. The brush worked nicely to build up foundation coverage on the skin with streaking or sliding the foundation. The bristles are dense but they are not too tightly packed. Also, it does not irritate the skin as all. If I talk about the grip, which was the main thing in the design to be made for Asian hands. I would say that for my hands, the handle is about one inch smaller. It was not uncomfortable if I take it as a travel sized brush but I would suggest that the company makes another version with a longer handle. But this size is for sure a perfect size for smaller hands. Since I did not wash it before use, I saw a slight shedding of about 4-5 bristles but I was aware that every new brush sheds a bit. I also washed this brush; it cleaned up really quick because of synthetic bristles and I did not see any shedding during or after wash. This brush also has a good value for money for the quality and results. Overall, I am loving this brush. 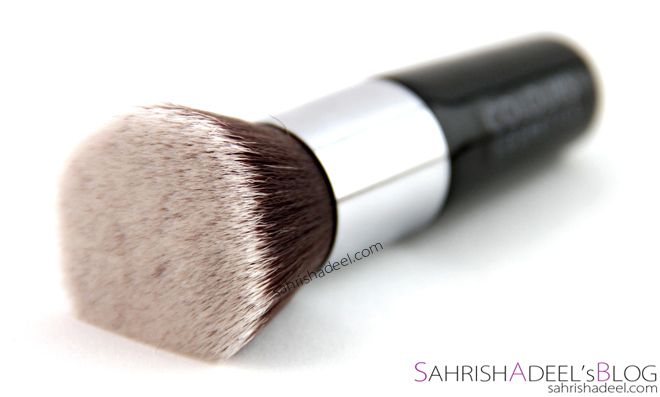 You can definitely compare the results with Sigma's F80 - Flat top kabuki brush but this one is faster and a lot softer. Gives a flawless finish to the foundation. Suitable for both liquid and powder foundations. Does not streak or slide the foundation while layering to achieve full coverage. Soft bristles are perfect for people with sensitive skin type. Handle size should have variations to be suitable for bigger Asian hands like mine. Colours Cosmetics is currently shipping to Malaysia only. For the residents of West Malaysia, the brush will cost RM 59 & for the residents of East Malaysia, the brush will cost RM 63. This is the sale price right now and they are currently offering free nationwide shipping plus they have COD for specific areas. You can find all the details about shipping and can buy this brush from their official website here. Also, join Colours Cosmetics Malaysia's Facebook page for any news, giveaways and promotions.